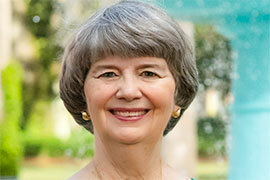 Linda Parson Davis ’73, retiring from Stetson on Jan. 31 after 41 years of service, now has an endowed scholarship in her honor. For more than four decades, Linda Parson Davis ’73 worked to ensure the availability of needed resources for students at Stetson University. She established the first full-time planned-giving program and most recently helped to guide the successful completion of her fourth major fundraising campaign. Now, an endowed scholarship bears her own name: the Linda P. Davis Endowed Scholarship. In October, Davis (middle) was presented with a special proclamation by Stetson President Wendy B. Libby, Ph.D., and Joe Cooper, Stetson University Board of Trustees chair. Then came a big surprise. 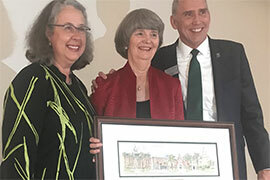 With Davis retiring on Jan. 31, 2019 — following 41 years of service to Stetson — Stetson President Wendy B. Libby and the board announced the scholarship, which will become available to students this fall. “I was completely surprised. It’s the most amazing honor … and extremely moving to me,” said Davis in early November. Davis held numerous positions of leadership in alumni relations and development, with titles that included Director of Alumni Programs, Director of Development, Associate Vice President for Planned Giving, Vice President for University Relations and her current role, Special Advisor to the President for Philanthropy. As a result, the creation of an endowed scholarship in her name was especially appropriate, according to Libby, who also had received a call from a Trustee encouraging her to create a scholarship in Davis’ honor. The funds raised to date already total more than $100,000. In turn, Davis’ chosen purpose of the scholarship also is a natural — providing financial assistance to Stetson students to participate in university-approved international study abroad and international learning opportunities. Her son, Joseph Davis ’15, M.B.A. ’16, had participated in several university trips for international learning. For Davis, the Linda P. Davis Endowed Scholarship is a parting gift from her alma mater, where she worked for 41 years. And it’s so much greater. Want to contribute to the Linda P. Davis Endowed Scholarship? Gifts may be mailed to Stetson University Office of Development, 421 N. Woodland Blvd., Unit 8286, DeLand, FL 32723 or given online at www.stetson.edu/give.